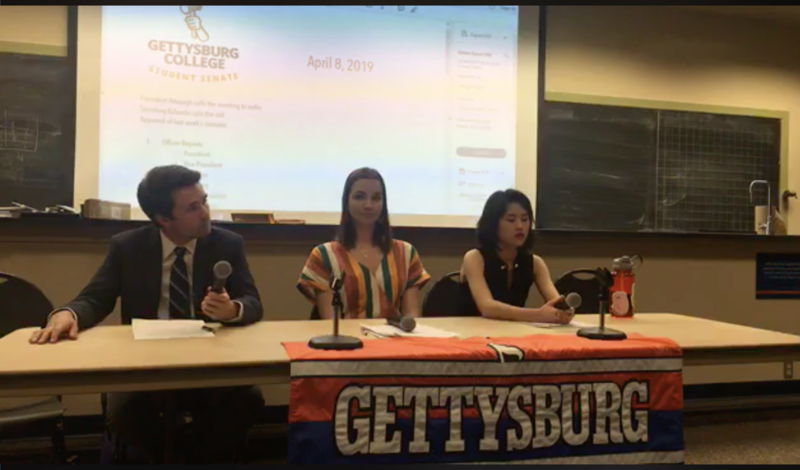 Adult Supervision, Diversity & Inclusion, and Hula Hoops: Candidates Discuss the Issues at Presidential, Vice Presidential Forums | The Gettysburgian. The Monday, Apr. 8 Student Senate meeting was consumed by election forums for the body’s presidential and vice presidential elections, which began Monday evening and continue through Sunday. Voters can click here to vote. The forums were moderated by The Gettysburgian‘s editor-in-chief, Benjamin Pontz ’20. The presidential candidates, Secretary Marisa Balanda ‘21, Senator Patrick McKenna ‘20, and Diversity Committee Chair Hannah Dalzell ‘20 delivered opening statements on why they believed that they should be elected Student Senate President for the 2019-20 academic year that largely tacked with their statements of purpose. Pontz asked the entire panel a few questions that probed their assessments of the Budget Management Committee (BMC) and current President Nick Arbaugh ‘20. Then, Pontz asked what contributions each candidate had made to improve diversity and inclusion at the college, especially considering each candidate mentioned diversity and inclusion as part of your campaign platform. Dalzell referenced her work with facilities to update the “You are here” maps on campus to include the ADA accessible pathways on campus. Pontz then went to ask McKenna about his involvement with, what Pontz called, “last year’s election imbroglio,” wherein current Treasurer Haley Gluhanich ‘19 and Balanda were found responsible for violating Senate election rules regarding voter intimidation. Last spring, Gluhanich stated that a member of the Senate Executive Board “reached out to me and said that I needed to, ‘get moving’ and I needed to ‘go hard,’ and that they were legitimately worried because people hadn’t been voting for me and that they were nervous I was not going to win.” McKenna, who was at the time Senate Parliamentarian and worked closely with Vice President Aimee Bosman ’18 in managing the election, later asserted that he was the one who talked to Gluhanich. Pontz asked McKenna if he had been in any possession of non-public information about voting of any kind. McKenna said he had not, but he conceded that, on the whole, the executive board did not communicate well either to the student body or the individuals accused. Following up on McKenna’s answer, Balanda was asked about her opinion piece in The Gettysburgian, “Marisa and the Terrible, Horrible, No Good, Very Bad Week.” In the piece, Marisa asserted that she believed that Senate needed more adult supervision. Balanda said that she feels that Jon Allen, Director of the Office of Student Activities and Greek Life (OSAGL) and advisor of Student Senate, embodies the adult supervision that she was seeking. During the open question and answer period, Melanie Pangol ’21 observed that community building a two-way street and asked why, given her struggles to get senate to pay attention to micro-aggressions, she should put faith in its capacity to bridge cultural divides. Balanda and McKenna expressed their belief that senators and executive board members should take the Intercultural Development Inventory (IDI), however, Dalzell disagreed. She believes that students should take the IDI if and because they want to. In the vice presidential debate, Rock Swartz ‘22 and Jack Lashendock ‘20 delivered opening statements about their talents for leading communities and how they felt that they would instrumental in the 2019-20 executive board. Pontz asked Swartz to expand on why he, as a first-year, would be qualified to sit on the executive board as vice president. Swartz cited his work as chair of the College Life Advisory Committee (CLAC), specifically in urging the development of the 14-swipe meal plan and the introduction of free and accessible menstruation hygiene products. In Lashendock’s statement of purpose, he mentioned that he had an “innate ability to lead.” He argued that his abilities in leadership should be taken to the seat of vice president, adding, “I think that by making sure that the senate works for everybody and has a diverse candidate pool, only then can it be truly the institution that we have imagined it to be.” Lashendock has never held a committee chair role in Senate and currently in not leading any campus organizations. The applications for technocratic executive board positions, as well as class senators and class officers, are currently open and close on Wednesday, Apr. 17. Student Senate will reconvene Monday, Apr. 15. Editor-in-Chief Benjamin Pontz contributed to this report.